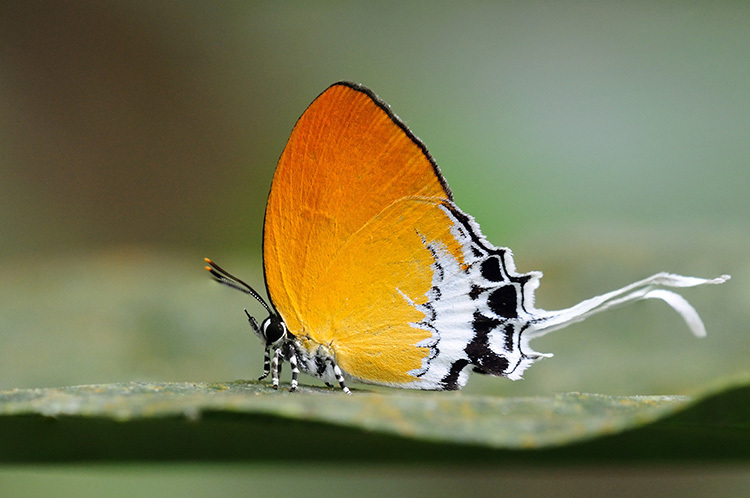 This pretty long-tailed Lycaenid is relatively common in Singapore's forested areas, usually in the vicinity of its caterpillar host plant, Smilax bracteata, an invasive forest weed. The butterfly is bright orange on the underside, with a black-and-white tornal area on the hindwing, and a long white tail at vein 2. It flies with a short, hopping flight, and prefers the shady forest understorey. Quite often, several individuals are observed together. This Branded Imperial was shot by ButterflyCircle member Mark Wong last weekend. It shows the butterfly perched on the top of a leaf, resting in the shade.